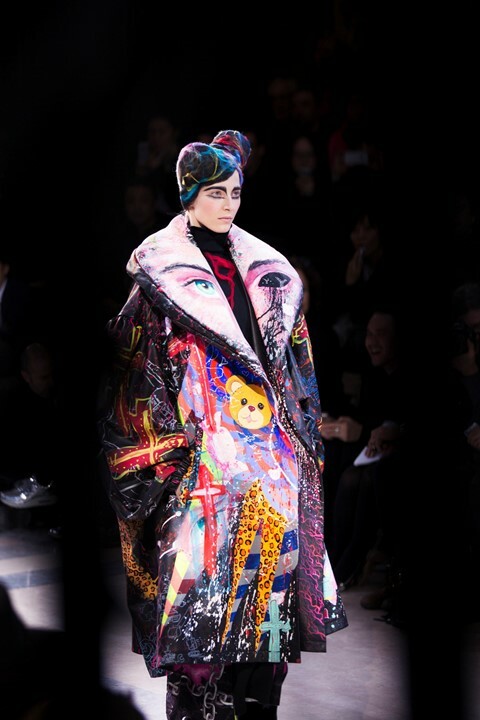 Manga fantasies played out on the runway. Acid coloured trolls and one-eyed demons became part of a hypnotic Japanese manga print that adorned enormous goose down padded coats. While hand painted illustrations of astronauts and leopards decorated leather coats. ‘Hair’ was crafted from coloured wool into extreme shapes, like abstract paintings. Each model was marked with black paint around their eyes, like fantasy warriors. This season it began with extreme cocoon-like volume, where garments quite literally engulfed the models before transitioning into longer knitted dresses closer to the human form, with loose threads that hung off the body. Printed manga mittens like baseball gloves, and floral wool patchworks felted into black jackets.